Decision trees help machines emulate human behavior. Thanks to artificial intelligence, programs can autonomously build decision trees by learning from existing real-life data. Can an AI system determine who was operating a particular vehicle by analyzing driving style? In the 1950s, TV stations were broadcasting howlers that probably wouldn't interest anyone today. One was "What's My Line?" with presenter John Daly, in which a blindfolded team of four panelists had to guess the identity of a star guest using only yes or no questions. A popular strategy was to pose general questions first ("Are you male? "), in order to ask more specific questions in the final round, until the panelists began to close in on the guest star and their identity was finally revealed. In machine learning, programmers employ similar techniques to teach computers to imitate learned behaviors. As a somewhat contrived example, take the behavior of an AND gate (Table 1), which always shows the 0 value at output until a 1 is applied to both inputs. The gate is normally implemented by binary operators, but for the purpose of this investigation, I'll be using the decision tree in Figure 1. Figure 1: Manually created decision tree for AND gates. The algorithm starts at the head node and checks whether the X input variable is set to 1. If this is not the case, further testing is unnecessary, and the result of 0 is final. If X is 1, on the other hand, the algorithm proceeds to the lower left to the Y==1? node. After evaluation, the end result is clear: If Y is also equal to 1, the AND gate displays 1, but if Y is 0, the gate value is 0. Now, of course, artificial intelligence (AI) can capture and simulate far more complex relationships than simple AND gates. However, the decision trees used there follow exactly the same procedure as in our simple example. In supervised learning, they receive input values such as X and Y and the expected output values, like the output values of the AND gate. 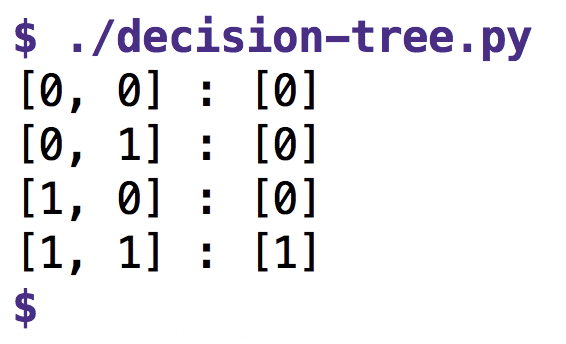 From this, decision trees are automatically being built internally and gradually honed until, in a fully trained state in production, the system generates exact results from new live input values – or at least values close to the ideal result. Listing 1  additionally imports the pydotplus module to print the decision tree for study purposes. The X Python list contains the previously known input values of the gate as a series of x/y values, also in list form. The Y variable contains the corresponding output values in the same order. 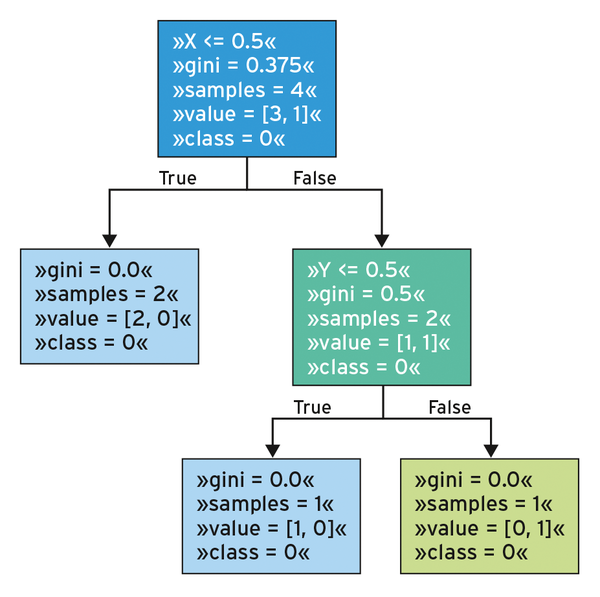 The tree class from the scikit-learn module (the abbreviated name sklearn is also valid) now offers the DecisionTreeClassifier, which approximates relationships by fitting with the fit() method; internally, it builds a tree and later predicts the results for new input values using predict(). Figure 2: Automatically generated decision tree for the AND gate. The output from the script in Figure 3 shows that, after the fitting phase, perfect results are obtained from all possible input values. Figure 3: After the learning phase, the script can reproduce the output values of the AND gate. At first glance, the machine-generated decision tree in Figure 2 looks a bit unorthodox, but machines think differently from humans; they just rigidly follow their algorithms. For example, the classifier first checks whether X is less than 0.5, and if that is the case, it outputs class=0 as a result in the True node below left. 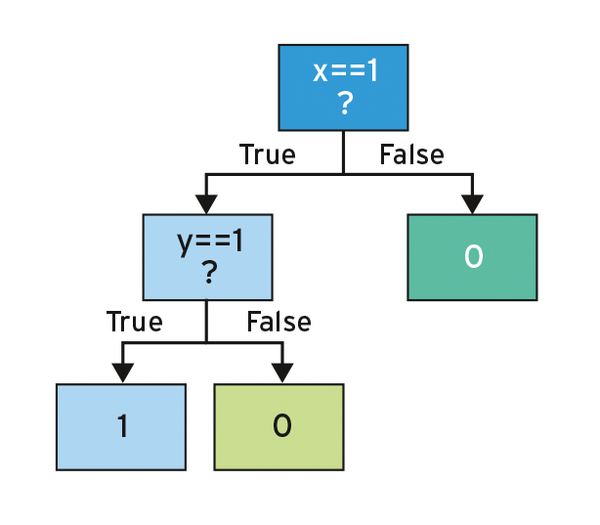 If X is greater than 0.5, however, the False node below right checks to see whether Y is less than 0.5 and displays 0 if yes and 1 if no; that is, it's equal to 1 in real life. The procedure performs as optimally as the tree in Figure 1 but – typical of a machine – somewhat non-humanly, just like the AlphaGo mastermind , which now ranks among the world's top Go board players, with some seemingly absurd moves that no one has ever tried before. With only one node in the tree, the system's entropy has decreased from 0.56 to 0.28. An additional node splits the remaining two result tuples into two individual results. In the case of X>0.5 where Y<=0.5, the entropy of the whole system drops to 0. Therefore, with two nodes, the tree can correctly predict the result for each arbitrary input tuple with 100 percent probability. In this case, it is of academic interest at most, because an AND gate can be set up in hardware or firmware much more efficiently. However, an algorithm that knows nothing of the internal structure at first and only learns from combinations of input and output values, mimicking the behavior of the unknown system, can be used to tackle arbitrarily complex problems. As a bonus, it even supports non-permitted input values such as [0.9,0.8], which it transforms into useful results (in this case, 1). The tree command can provide a clear view of all your files and directories and offers a few advantages over the usual ls command.